Eben Dobson is an avid golfer, and golf is all about courtesy. There are no beanballs, no penalty boxes, no headbutting. A golfer will, for instance, rake a sand trap so that it’s “like new” for the next player. Eben invented a tool to clear the putting green of sand for the golfers up next. The seed of the idea was sown when Eben worked at a golf course while he was in college. Mornings found him clearing dew and small debris (e.g., grass clippings) off the greens with a dew whip (a long, tapered fiberglass pole). He noticed that it also removed sand and loose soil and wondered about a tool that could do that. The idea came back to him as he watched his golf partners use the back of a hand, a towel or a hat to clear the sand from the green, because it must be done carefully. It’s against the rules to press something into the green or roughen or scrape its surface. Eben, an established financial planner with professional athletes among his clientele, made it his mission to find a solution to sand on the green. He worked with a brush company and, after a slew of prototypes, came up with the Wisp, a tool with bristles gentle enough for the delicate grass on a putting green, yet effective enough to clear away the sand for the next golfer. And it was approved by the finicky USGA! The problem was that golfers were “borrowing” the Wisp to clean other things. Eben soon realized that he had on his hands a revolutionary cleaning product and established WISP Industries. The WISP Cleaning System includes a high-tech broom with a handle that telescopes from 28 inches to 50 inches and Bristle Seal® Technology with short, dense electrostatic bristles at a 90-degree angle that work like a squeegee against the floor—no more dirt and dust flying up as you clean. 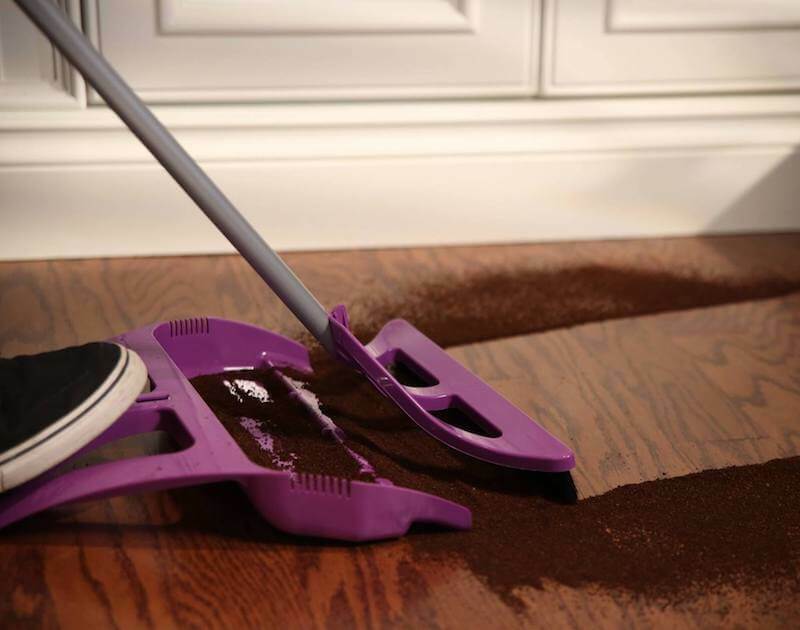 The WISPpan allows you to sweep it all up by stepping on the pan’s handle with the ball of your foot, creating a seal with the floor so that the dust and dirt go right into the pan. Also, there is a comb on the side of the pan that cleans the bristles. The WISPaway component is the easy, wall-mounted storage. The miniWisp is a 6-inch version of the broom for cleaning countertops of spilled cereal, coffee grounds and the like and, for instance, pet hair from the the upholstery and car seats. The miniWISP has its own “cute as a button” miniWISPpan. The WISP goes where no broom has gone before. It is designed for tight spaces and hard-to-reach places. The 90-degree angle of the bristles gets easily into those corners and along those edges, under furniture, inside cabinets, on top of window sills—wherever you need it, it’s there. Gone are the cobwebs and the fine dust that accumulates on window screens. The WISP is one of the top-rated products on QVC, and the miniWISP was voted one of the “Top 10 Coolest Products” at the Golf Industry Show. Eben, even with his CEO responsibilities, still has time to indulge his passion for golf and share that passion with young people. He established the Lester Hyashi Memorial Foundation that awards college scholarships to underserved junior golfers.